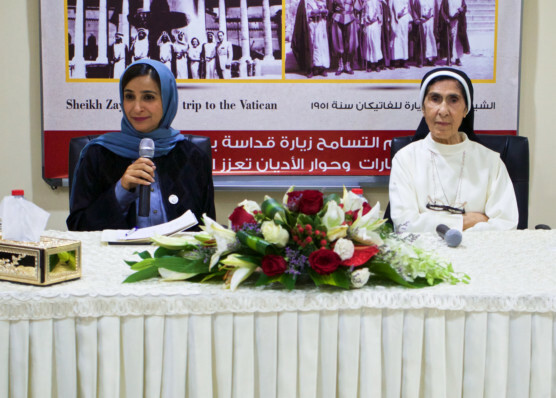 Dubai: The first private school managed by Catholic nuns and licensed by the Ministry of Education in Dubai — Al Rashed Al Saleh Private School — received a special guest on Sunday — Jameela Bint Salem Al Muhairi, Minister of State for Public Education. The minister’s visit to the school, which is one of the oldest in the UAE, is in line with the Year of Tolerance and coincides with the historic visit of the Pope Francis and Dr Ahmad Al Tayeb to the UAE. Al Muhairi was accompanied by a group of students (grades 10, 11 and 12), three Moral Education teachers and parents representing the stakeholders of the Emirati School who were greeted by Sister Samira Ayoub Botrus, the Founder and school Principal, a press release said. Established in 1971, the school is a testament to the peaceful coexistence and harmony among different ethnic groups with different beliefs in the UAE. With its very modest fees, the school has served generations of students over the years, including the children of His Highness Shaikh Mohammad Bin Rashid Al Maktoum, Vice-President and Prime Minister of the UAE and Ruler of Dubai. For years, the school which has students from diverse backgrounds has performed well academically and has been ranked as ‘good’ according to KHDA’s inspection. Citing that such visits “are instrumental for instilling essential values in our youth,” she said it was the ministry’s role not just to teach the students about tolerance but also demonstrate how it should be practised in real life. Al Muhairi also stressed on the role schools play in promoting such values and building the characters of students.